We would like to share some photos and video clips from some of the recent food distribution programs conducted by our Ashram in Andhra Pradresh. This set of photos is from Pandirivalasa village, in Vishakapatnam district of Andhra Pradesh. 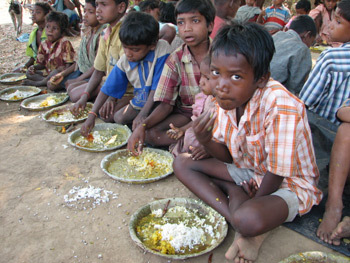 We would like to give you a small update on the food relief activities being run from our Ashram in Andhra Pradesh. We initially launched the food relief activities in Andhra Pradesh one and a half years ago, and since then we have been able to distribute spiritual food to over 150,000 people in the districts of Vizianagaram and Vishakapatnam. The devotees have been cooking and distributing food 15 to 20 days each month without fail, feeding 500 to 700 people each day. This month we were approached by Mr. Victor, the principal of Mandal Parishad Primary School in the rural village of Jonnavalasa, Vizianagaram district of Andhra Pradesh. He heard of our ashram’s food distribution programs in Vizianagaram and requested us to do something for the children in his school. Already the children receive daily meals from the government, through the national mid-day meal program, so we asked in what way we could be of assistance. He replied that the children could use school uniforms, as their families cannot afford them. We are happy to inform you that the Bhaktivedanta Ashram has recently begun food distribution programs in Andhra Pradesh. Currently we are conducting the activities throughout Vizianagaram district based from our ashram located in Vizianagaram, in the North of Andhra Pradesh. In the initial stages we are planning to distribute food 15 times a month in various tribal villages within 100 kilometers of our ashram. 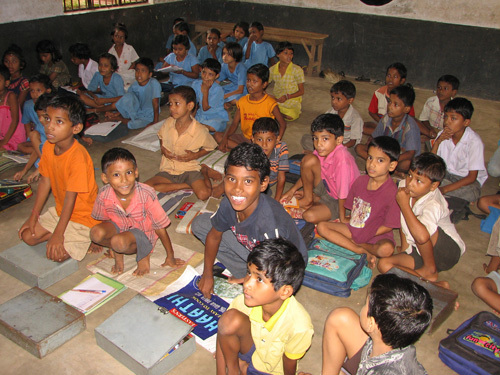 Below are a few recent photos of a program for 300 children at Bhadrak Primary School. We have begun distribution of school supplies to poor students in rural areas who are unable to afford their own. We do not want children to feel discouraged from studying due to the expenses involved in purchasing basic things like notebooks, pens and school uniforms. Already the importance of education is often not understood in rural areas. When poor students are required to spend money to attend school, few will be willing to participate. Below are a few recent photos of the food distribution program we are conducting in the village of Ulanga. Ulanga is a small village located around 5 km from our relief center in Randiya. 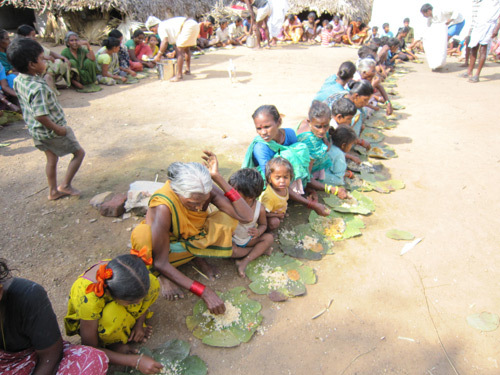 Like Randiya, it is also an adivasi (tribal) village. In our previous newsletter we showed you pictures and a video of the children of Randiya and the weekly food distribution we conduct in that village. For the new year we thought it would be nice to give these children a small gift that they could really relate to, something that would allow them to just be children for a day. Below are a few recent photos of the food distribution program being conducted in Randiya at our Ashram’s relief center. There is also an 8 minute video, so that you can get a better view of the children whom you are helping. 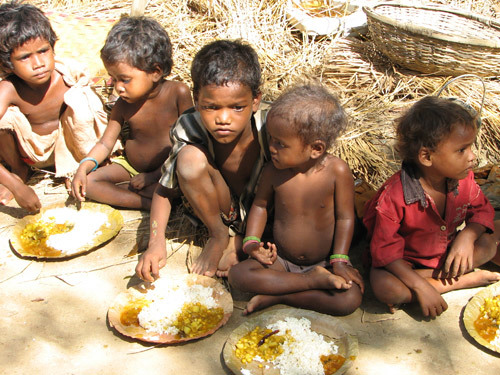 Randiya is a very poor rural village located around 20 km away from our main Ashram in Orissa. 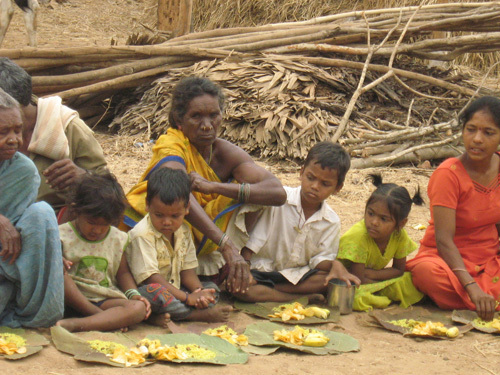 The village consists of people from the adivasi (tribal) community. Most of the villagers work as field laborers on other people’s farms, tilling the fields and growing rice. Due to poverty, the children of the village have to start working as young as 6 years old, and their usual daily meal is one of just plain rice and salt. 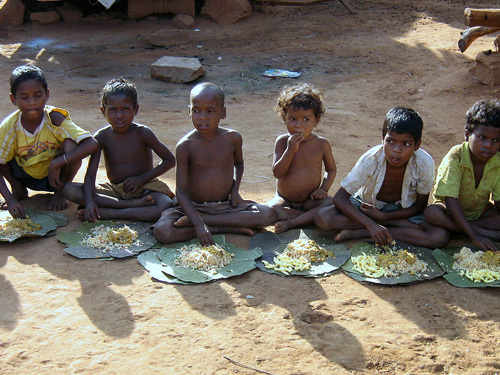 As you can see in the photos and video, many of the children do not even have clothes to wear. 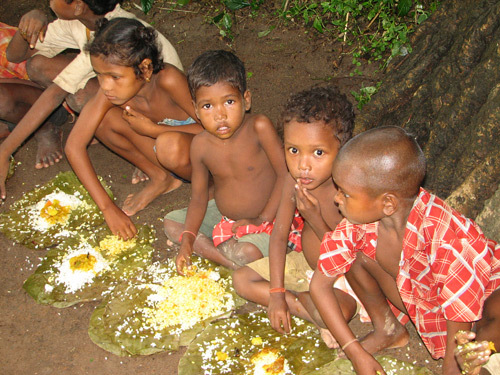 Another village has been added to our food relief program in Orissa. The village of Ugalpur is located around 6 kilometers outside of Bhadrak. 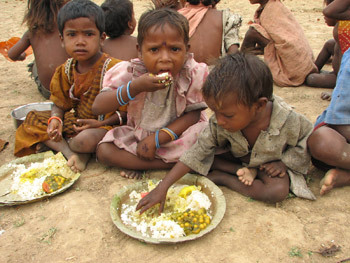 Here are a few photos of the children from this village and the recent food distribution. We have also included a three minute video clip at the top of the page. This month we have begun food distribution in a new village, Bagurai Leprosy Colony, located a few kilometers outside of Bhadrak, in Orissa. As the name implies, most of the children in the village have parents affected by leprosy. This makes it even harder for their families to earn money, and take care of the children properly. We are trying to provide a little help in the form of spiritual food, so that the children can at least receive a few nourishing meals. We provide a few photos below of the wonderful children from this village and the recent relief work. We have also included a 3 minute video clip at the top of the page.